They are planning a sit-in-protest in front of the Camp Schwab to take place in the morning from April 6 to 8. They will take part in a rally of about 10,000 people, which will be held at Okinawa Cellular Stadium, Naha, on May 17. They will ask other assembly members to take part in the organization, and aim to increase the number of participants to several hundred. 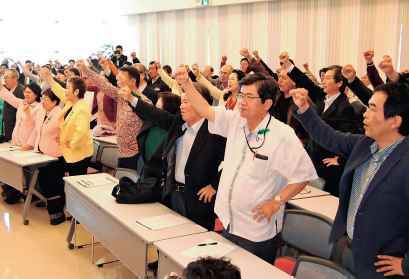 House of Representatives lawmakers Kantoku Teruya, Seiken Akamine, Denny Tamaki, Toshinobu Nakazato and Upper House lawmaker Keiko Itokazu became joint representatives of the organization. Satoru Nakasone, chairperson of the ruling party of the prefectural assembly, serves as the secretary-general of the organization.